If you are leading children’s ministry, your volunteers and leaders need three things from you. One–vision for why they do what they do. Two–training skills. Three—keeping connected with them relationally. But it is so difficult to get people to attend training events! How do you give them what they need from you if you have so little contact? Use Snack Sized Videos. These are short and sweet training topics only two or three minutes long. Your people can watch them on their computer, tablet or smart phone. When you send them the link by text or email you can also inspire them with your vision. You can invite personal response and stay connected with them on a more personal level. All this can be done with sending two Snack Sized Videos a month. It’s a simple as sending emails or texts! Before long, you might be making your own Snack Sized Videos to be even more personal in your training tips! Do you want more explanation? This Workshop audio recording, Train Your Volunteers Online…Simply will help. 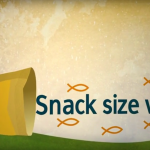 Click below on the links to take a bite out of our new Snack Size videos! These two-minute videos will train, inform and inspire both you and your volunteers on a variety of practical, real-life ministry topics. There are several videos in each category! So what are you waiting for? Let’s dig in!!! The most critical task you have as a leader is to make sure you are spiritually, emotionally, mentally and physically replenished. You need to fill your own tank before you can effectively give to others! These snack sized videos will point you in the right direction as you make the choice to lead yourself first. Let’s dig in and find out how to fill our own tank before we pour out into others’ lives! These videos for children’s ministry leaders give great ideas and tips on leading yourself into a better relationship with God. An hour in prayer? Yes, you can!! Are you dealing with Itty Bitty Bullies? How do I develop a heart of prayer in my Preschooler? Help has arrived on answers to these questions and more in our short Snack Size Training Videos. What makes those little people tick, anyway? Open up these videos to know more about understanding preschoolers – Sharing, bullying, praying, anger and more. Why are my 2 and 3 year olds acting this way? Why are my 4 and 5 year olds acting this way? What’s the difference between a 1st Grader and a 4th Grader? How do I place God’s Word on the heart of a grade-schooler? Let’s find out more about the grade schoolers in our lives, and how we can minister to them right where they’re at. We’ll give you ideas on how to put God’s Word in their Heart for keeps. Another topic is “Doing Crafts Right” with the “big” kids. Do You Need Help Understanding Preteens? We’re in uncharted waters here, folks, when it comes to understanding preteens. Let’s explore what’s going on in the preteen mind and how we can reach them for Jesus. These short videos will help small group leaders understand what 5th and 6th graders are like and how best to work with them. Improve your leadership skills & learn recruiting tips by watching these short director and leader tips. Learn how to look for signs of child abuse and how to keep your kids safe with great security information. Be all that you can be! As a kidmin director, that is. Here’s a short video to use for recruiting volunteers. Our purpose is to equip children’s ministries and family ministries for highly effective discipleship. We accomplish this purpose by providing innovative curriculum and a variety of training opportunities. As a kidmin coach, you are there for your volunteers.The ones who are in the trenches shepherding groups of children each week. How best do you empower and encourage them to be the best that they can be? How can you be their champion week after week? Let’s unpack this video series to learn more about how we can empower our Coaches and Small Group Leaders each week. Eek!! Why is this Volunteer Always Absent? As a shepherd, you are leading little ones each week. You have a heart for serving the Lord and serving kids. These videos will help you hone your skills to reach each child in the most effective way possible. Practical ides on group management, making kids feel special, doing crafts the right way, and much more! These training videos for Small Group Leaders will show you how to set the stage for kids to learn all they can about Jesus each week they’re with you! Learn how to listen to your kids and how to keep their attention. What are You Saying Without A Word? I’m Done With My Project: Now What? Breaking Out the Glue Sticks is Worth It! Here are some great topics for improving the ways your large group leaders present the Bible to your kids. Let’s share the most important message in the world with skill and confidence! These videos give you great ideas on how to prepare yourself and your stage and keep your kids attention throughout the entire lesson. So You Wanna Be a Large Group Leader: You’ve Got What It Takes! Puppets have a way of capturing children’s attention in a way few other things do. These videos, hosted by a professional puppeteer, will give you some great tips and techniques for making your puppet presentations even more captivating! When visitors come to your church, first impressions are critical. What are some ways that you can make your Welcome Team ministry stand out in the way you receive and welcome others? How can you touch the hearts of the new children and families you see each week? Take a look at these videos to find out! When people walk into your children’s area, what does it say to them? Does it say that your church places a high priority on children? That it really values them? If you can’t give a strong “yes” to this question, please check out these videos! They are full of creative, cost effective ways to transform your space to make it a place where kids will love to come!